Last Thursday’s Gown About Town was amazing! We had the Hi-Lo Club packed by 7:00 pm. Everyone looked amazing. There were Kenzo jackets and handmade gowns. All the women I met were doing fantastic things, from running non-profits for battered women, to life coaching. And like any good party, I broke my dress. 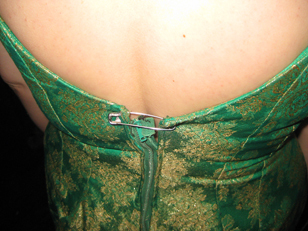 The ever-prepared Eve Batey had an extra safety pin on her underskirt. She pinned up the back of my zipper, that I had broken with my ginormous tatas, and told me the pin made me look cool, like The Clash. 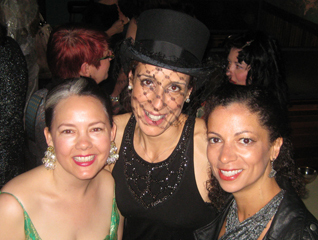 Ever since she said that I’ve been imagining what a Supremes-like back up singing group for The Clash would look like. I’ve also decided if I ever get my hands on a time machine, I’m going to make that happen. Not only did we have a great time but we raised $300 in donations for SFCASA. Thank you so much to everyone who attended. Those who weren’t able to attend, don’t worry. We’re thinking of having a Hats and Hooch event next.